Aluminum ore is metal ore, high hardness. Its processing and other non-metallic minerals in the process has a different design and equipment matching. 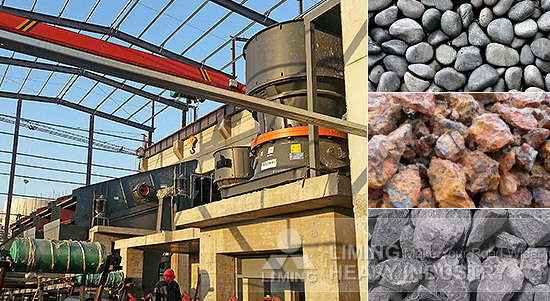 Aluminum ore processing technology include: crushing, grinding, beneficiation three processes. Chunks of aluminum ore is evenly sent to jaw crusher or mobile jaw crusher by vibrating feeder for coarse crushing. The aluminum ore after coarse crushing through vibrating screen is conveyed to single-cylinder hydraulic cone crusher for secondary crushing. Then, the material into the multi-cylinder hydraulic cone crusher for fine crushing. The output size can be adjusted to 13mm or less. The crushed pieces of aluminum ore is sent to ball mill for grinding, and screening by the spiral classifier. The powder does not meet the requirements will be fed into the ball mill to continue grinding. The aluminum powder that meet requirements is send into the flotation machine, and then into the dryer to obtain refined aluminum powder.